For a long time the Pro Tools community has been looking for a mobile Pro Tools solution whilst at the same time retaining HD performance. Avid’s first step towards this was the launch of Pro Tools HD Native - a PCIe based card that handled the processing for Pro Tools from within a native computer, this differs from DSP based HD or HDX, where dedicated DSP chips on card handle the processing. So HD Native can be considered the middle ground between simple computer based processing and full blown DSP based - that is reflected in both performance and price. 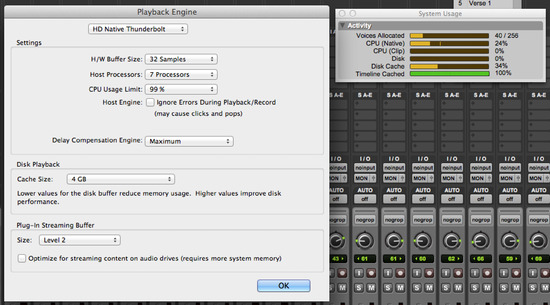 It also offers a step from basic Pro Tools to HD, without the large cost. HD Native was the first step and now Avid HD Native Thunderbolt is the next, allowing the user to use Thunderbolt technology and have a Pro Tools HD experience but now on laptops and desktops that do not have the PCIe capability. Metal extrusion box acts as a heat-sink to dissipate heat without the need for a fan. Front panel headphone connector, with volume control and push/push mute switch. Red/Green LED to denote mute setting. The headphone output jack mirrors outputs 1 and 2 on our primary HD device. Rear panel includes 1 x Thunderbolt port, 2 x DigiLink Ports (32 channels of audio on each), DigiSerial port for sync devices, an FPGA reset switch and a power connector (not required to operate). There is a Kensington lock port on the case as well as 19” rack mount holes on the base of the unit. It comes with a DigiLink cable, Thunderbolt cable, manual and install disc. As we always try first - we tried to break it, so we tried to run it on my unqualified i5 2012 Macbook Air 13” - it didn’t want to play, reporting that it could not launch. So, as I was advised, I needed an i7 equipped device, I called up James Ivey and invited him for lunch and told him I needed an i7 - the plan worked. Within an hour he was on the doorstep with his MacBook Pro 2012 with a retina display. Lunch was put on hold and we fired up his MacBook Pro. First we installed Pro Tools 10.2.1, this came in the box and we assume has the necessary Thunderbolt drivers. then we plugged in the Thunderbolt box to my HD Omni and then plugged in the Thunderbolt cable into James’ MacBook Pro. Then in a second attempt to break it, we loaded a session from a USB stick. It loaded and played not a problem. However, I was not content with this test, so I decided to throw a large session (fig 1) onto a Freecom USB drive and then load that into Pro Tools to test. We also pushed the settings hard (fig 2), in fact in a way you would never do in the real world - mixing a large session with a 32 sample buffer. It played without an issue. We didn’t throw lots of plug-ins at it, but we’re guessing that would require pushing the buffer to a max 1024 samples. Still pretty impressive and of course helped by the Timeline Cache. fig 2We then wanted to test the headphone amp on the box, claiming to be something very special. We did A/B comparisons between the Thunderbolt box and the Omni and the Thunderbolt headphone amp seemed to have a greater dynamic range, as well as being bloody loud! Whatever the fact, it sounds really nice and open. It would be great for live sound engineers who need to monitor in a live sound environment whilst capturing a live recording. Of course many will want to see how the Thunderbolt version measures up when recording, in particular latency performance. We didn’t have time to test the recording, after all, lunch was just on hold, not cancelled! However, we have no reason to doubt that it will be any worse than using the Native card, which clocks in at 1.7ms. The tests we performed, although nowhere near as scientific as those you will read in Sound On Sound, showed us that the Thunderbolt box was rock solid and equalled the performance of the internal card, but with the added option of being mobile and not requiring a PCIe slot in your computer. Of course, we would love to be able to use the box without any HD hardware attached, there’s rumours of a firmware upgrade coming to allow that, but no one at Avid (repeat after me ‘revenue recognition’) will confirm any such rumour - so don’t even think about buying one on the basis of that rumour, if it doesn’t happen then don’t blame us, it’s a rumour, nothing else. However, if it does come true, then you heard it here first. With the box released from the need for HD hardware then you have a real mobile solution, although in another way, it’s kind of theoretical. If you are going to record then you need I/O and if you want to mix on the move, then you don’t need any hardware. The only benefit would be the super headphone amp on the box. First! OK I got that out of the way. Yes Avid, the company who many accuse of dragging their innovative feet, have got the first Thunderbolt solution to market, and a Pro Tools HD one to boot, so kudos to them for that. Making a HD solution that does not rely on internal cards is a great move, for those with Thunderbolt equipped i7 iMac, MacBook Pro and Mac Mini, then this is a great way into the world of Pro Tools HD. Of course there are also Thunderbolt solutions coming for Windows based PCs too. The performance is without question and matches my Native card - we will do a part 2 of this review at James’ studio where we will track through the box and see if we can break it. I’m guessing not. 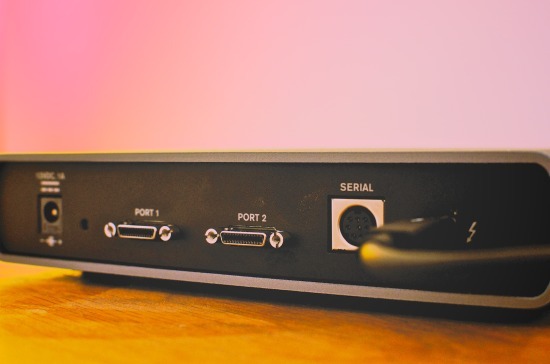 The first minor gripe and noted by several community members, is the fact that the box only has one Thunderbolt port, meaning it has to sit on the end of your Thunderbolt connection chain. I did check on the Apple Store and found that 80-90% of the Thunderbolt drives do have dual Thunderbolt posts, so it’s just a case of being careful when choosing. It would have been better to have dual ports and maximum flexibility. Avid are offering some attractive upgrade pricing to tempt owners of 00 series and Mbox Pro to make the leap, with a chunk of money off; a bundle of the Thunderbolt box, Omni and Pro Tools HD clocks in at around £2599 plus VAT. This is where I add my second minor gripe, you can hear us discuss it on this Podcast 31, it’s the options Avid are offering to buy it right now. There will be many Native and HDX owners who have the necessary hardware and just need to plug in a Thunderbolt box - there should be options for these owners to be able to buy just the box. If Avid ignore this, then that’s a huge omission. It would be easy to administer this using hardware serial numbers and user registration. I’ve already shot off an email to Avid people highlighting this. Go on Avid, go the extra mile and give even more people the chance to own it, without having to buy a bundle they don’t need! If nothing else, why design such a fantastic product, if half of your potential purchasers pass it over because of restrictive bundles? In closing, the Thunderbolt box is a great achievement for Avid, it’s a mighty little atom, with plenty of power and a great sounding, as well as bloody loud, headphone amp. If Avid can sort out some of the pricing for those who already own hardware, then I think this will be a great success. If you are yet to take the plunge into the world of HD, then this may be the one for you, offering you all the power of HD Native but with the convenience of Thunderbolt. Ironically, had Avid offered more buying choices then this could have got my Editors Choice Award, but I already have a Native card and an Omni, so I couldn’t choose one if I wanted to. If they have a rethink about this, then I’ll have a rethink about the Award. However, don’t let my misanthropic musings distract you from the fact that this is a great product from Avid, our whole team have given it a thumbs up. It is well worth serious consideration for those wanting to get into Pro Tools HD at a great price. Check it out.